Welcome To Rockville 2018 Lineup Revealed! Stone Temple Pilots — who just debuted their new singer Jeff Gutt last night — have been added to the unparalleled music lineup for the eighth annual Monster Energy Welcome To Rockville, Friday, April 27, Saturday, April 28 & Sunday, April 29, 2018 at Metropolitan Park in Jacksonville, FL. 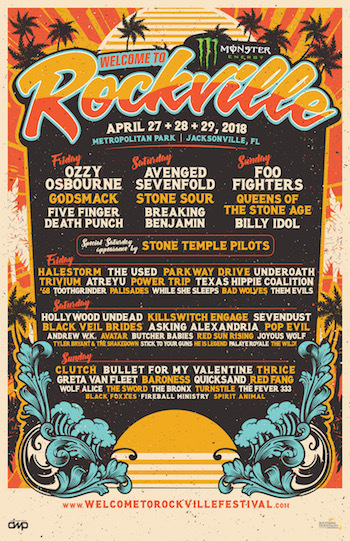 Florida’s Biggest Rock Experience grows to three days in 2018 with Foo Fighters, Ozzy Osbourne, Avenged Sevenfold, Queens of the Stone Age, Billy Idol, Godsmack, Stone Sour, and Five Finger Death Punch leading an incredible talent lineup not seen at any other U.S. rock festival. Other additions to this unprecedented rock experience—created by Jacksonville native Danny Wimmer of Danny Wimmer Presents—include Toothgrinder (Friday), He Is Legend (Saturday), and Wolf Alice (Sunday). Avenged Sevenfold, Stone Sour, Breaking Benjamin, Stone Temple Pilots, Hollywood Undead, Killswitch Engage, Black Veil Brides, Asking Alexandria, Sevendust, Pop Evil, Andrew W.K., Avatar, Butcher Babies, Red Sun Rising, Joyous Wolf, Tyler Bryant & The Shakedown, He Is Legend, Stick To Your Guns, Palaye Royale, The Wild! Monster Energy Welcome To Rockville tickets, VIP packages, as well as hotel and camping options are on sale now. Discounted online hotel rates are also available through Curadora. Visit www.WelcomeToRockvilleFestival.com for details. As in the past, General Admission ticket discounts are also available for active military through Monster Energy Welcome To Rockville partner GovX (www.govx.com). As previously announced, for the first time, Monster Energy Welcome To Rockville is offering car and RV camping spots for attendees. Camping spots at Tailgaters Parking lots include four nights of camping in a secured lot featuring indoor restrooms, shower trailers and access to a full restaurant and general store. Monster Energy Welcome To Rockville kicks off the annual World’s Loudest Month festival series and will also feature a variety of onsite experiences, including the Monster Energy Experience (featuring Monster Energy tastings and signings with select Rockville artists), The Music Experience (an interactive exhibit and musical instrument retailer), F.Y.E. Fan Experience (purchase your favorite album and get it signed by select Rockville artists), Zippo, and Take Me Home nonprofit animal rescue organization, among others. Attendees will enjoy local and regional food favorites in the Monster Energy Welcome To Rockville “Grub” zone, while fans 21+ can wash down Monster Energy Welcome To Rockville‘s over-the-top food offerings with a variety of beverages, including selections from the Caduceus Cellars & Merkin Vineyards Wine Garden (owned by Arizona resident Maynard James Keenan, co-founder of international recording acts TOOL, A Perfect Circle, and Puscifer), Heavy Tiki Bar (an oasis filled with killer cocktails and shade), and local craft beer. Monster Energy Welcome To Rockville is fueled by Monster Energy. Additional 2018 sponsors include: The Music Experience, F.Y.E., Zippo, and more to be announced. Monster Energy Welcome To Rockville is produced by Danny Wimmer Presents, a producer of some of the biggest rock festivals in America, including Rock On The Range, Monster Energy Aftershock, Louder Than Life, Monster Energy Fort Rock, Monster Energy Carolina Rebellion, Chicago Open Air, Bourbon & Beyond, Monster Energy Rock Allegiance, Northern Invasion and more. Monster Energy Welcome To Rockville kicks off the annual World’s Loudest Month festival series.